Shoshana Technologies, developer of the Rosemark home care practice management system, has been making home care management software for over 20 years. 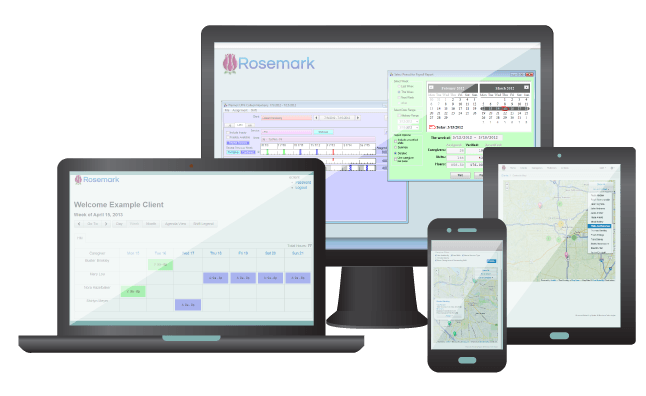 Rosemark, released in 2003, is a powerful scheduling and administrative tool for home care agencies. Rosemark is designed to meet the specific needs of home care. Built with a unique mobile-hybrid deployment, Rosemark gives you all the convenience of its traditional desktop application delivered to your mobile device. Manage your office and staff with project management software-like task management capabilities that allow you to assign people and priorities to individual tasks and monitor progress. Rosemark even includes marketing functions like customer relationship management (CRM), contact management, integrated telephony, and client retention features. The scheduling functionality is unique; color-coded visual cues, skill matching, caregiver exclusions, location mapping, and shift-based scheduling allow you unparalleled flexibility and control over your agency and agents’ schedules. Additionally, Rosemark has a pre-built integration with QuickBooks, enabling full communication between the software systems for easy invoicing, payroll, and other financial functions. Lastly, Shoshana offers unlimited personal training and support online or on the phone; never be left without an answer to a time-sensitive problem again. Not in home health care? See more practice management software systems in our SmartAdvisor! Learn everything you need to know about Rosemark. Our experts will reach out to you shortly.